In all honesty, I was severely lacking inspiration for Looks by Lau before the blizzard. I tend to overthink my ideas, which often leads to a packed computer trash can of never-to-be-seen shots. Upon waking up to the aftermath of Winter Storm Juno, however, I couldn't help but feel like a giddy middle school kid again. There is something about a fresh blanket of snow that instantly lifts my excitement, even as a twenty-year-old who now understands its hindrance to commuting. As a result, I am now sharing with you one of the most spontaneous posts I've created to date, and I couldn't be happier with it. 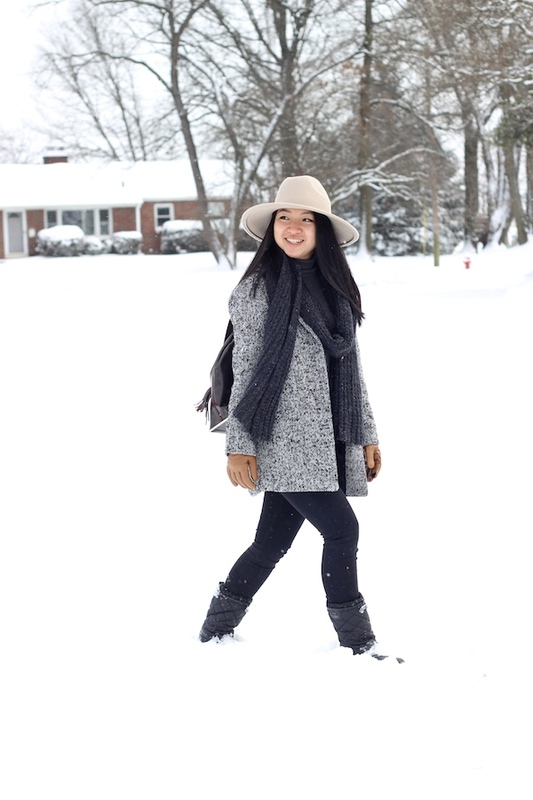 Dressing for the Northeast's snowy weather involves two important things: comfort and practicality. As a blogger, I welcome the challenge of throwing style into the mix as well. Accessories are the key to taking on the winter, so today I'm relying on a sturdy leather backpack, plush-lined gloves, and quilted boots (borrowed from my momma). 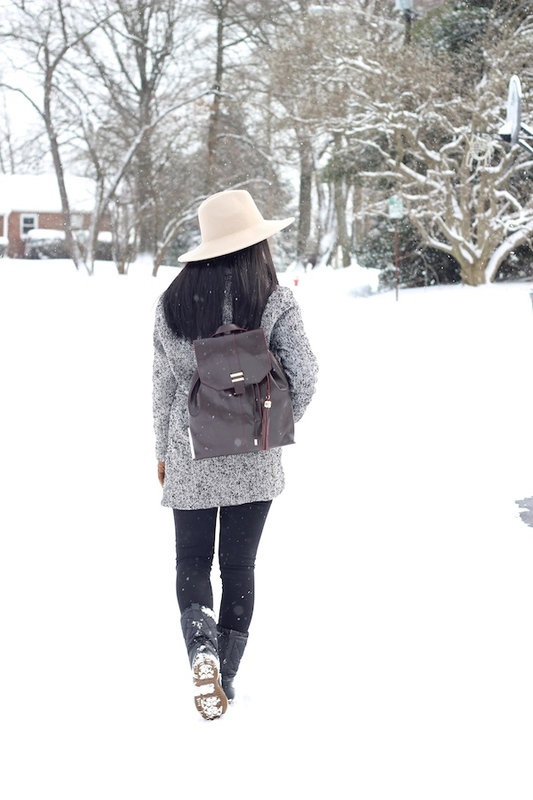 Each piece ensures a stress-free commute through the snow in style. Let's worry less and enjoy more, shall we? Ahh loved this cute post! So much snow - wish we got as much! That hat is gorgeous by the way and goes perfectly with that cute grey coat! Also loving the back pack - such a cute addition! I love how happy you look in all of your photos! 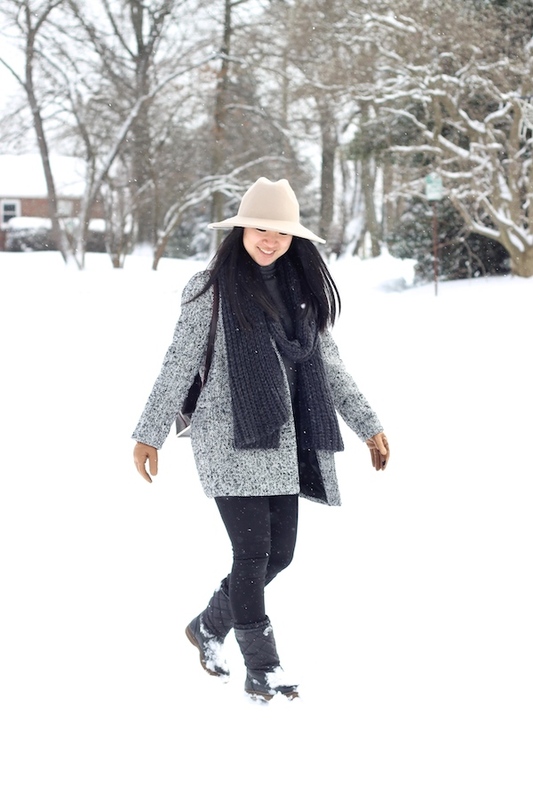 Also forever envious of your ability to make winter look so chic! Thanks Ada! :) Although I wish winter would end already haha! It's very sunny where I am in Australia at the moment, so this seems a world away! Love love that coat - I've been looking for something similar for ages! Thanks so much!! I wish it were summer weather here haha! 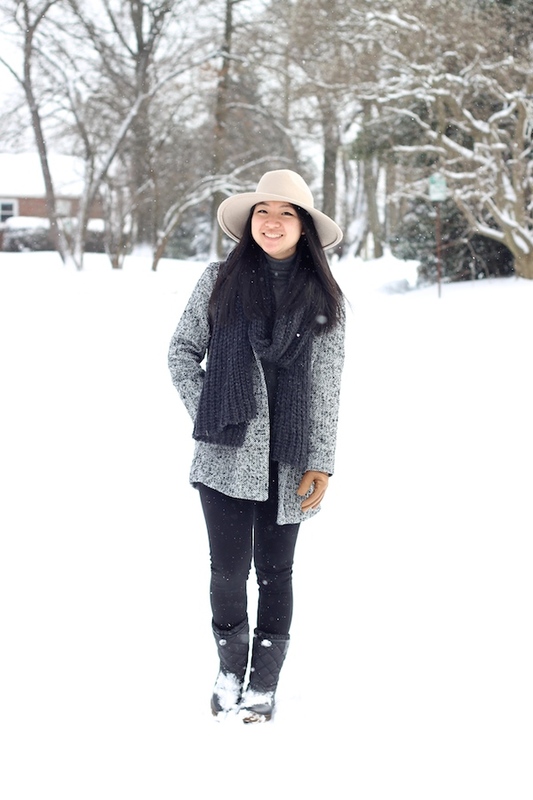 this look is very nice, I also love the snow, and this hat is so great!!!! Agreed!! Especially with the new semester starting haha. Thanks Claire! You are the cutest! Love your backpack girl! Well, despite Juno, these pictures are all SOOO GORGEOUS! I bet you were freezing, shooting for this though. But that hat totally vibes. :) I hope you can come visit my bloggie now too. I style and interview ethical fashion brands! :D Looking forward to your visit. Thanks girl!! I wish I had your warm weather though haha! omg i love this outfit! i really admire your style <3 i also live in the northeast so i know the struggle lol. btw, im considering going to FIT for fashion merchandising next year. is it a good program? do you have any advice for me? thanks in advance! God bless! Thank you!! :) FIT has a great business program, and I think just being in the city alone has opened up amazing opportunities that I wouldn't find elsewhere. Please feel free to shoot me an email so I can give you more specific advice! The snow looks so beautiful! I would agree that dressing for piercing cold weather is super difficult but you made it look so stylish! Love your coat and hat! Pretty ! 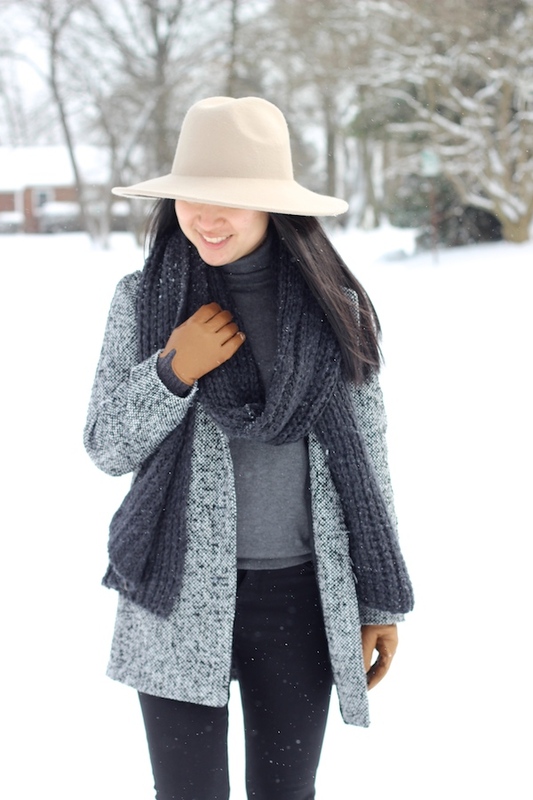 Your winter look is amazing!